In the months following that first illustration I’d randomly stumble across other caricatures of her where different artists couldn’t seem to agree on whether or not her eyes were too close together, or far apart. Is her nose big or tiny? Is her mouth little or huge? And for some reason these questions seemed to be plaguing the renderings throughout my searches at Google Images. After realizing all of this, I assigned myself the personal challenge of capturing a recognizable likeness WITHOUT the snarl, or growl, or sneering. 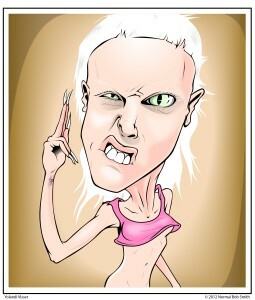 A normal facial expression that is clearly, unquestionably, a portrait of Yolandi. After my first few stumblings I found myself running into these same corner-cutting solutions other artists before me had fallen into. Make her eyes farther apart and that’ll separate her from any other girl with that haircut. How about her eyes closer together? No, that’s not it either. Clearly a tiny little button nose is what makes her so adorable. Nope. Well, she doesn’t have a big nose either. How about no nose at all? Then the viewer’s eye can sort it out. Right? Five illustrations later and I was getting nowhere. Simply putting sharp, shortened bangs on a strange looking little girl wouldn’t cut it. And I swear to you, with each sketch I put to paper she got uglier and uglier. It was terribly, terribly frustrating. I put the project away for about a week before I could return to it again. I had to try something new. A new angle. That was the key. It was the three-quarter view that gave me the base to sculpt the shape of her face around. It’s the first right thing that happened in this project. After I had a completed sketch, I scanned it into my computer and traced it in Adobe Illustrator. This is where I can cheat some more and do all the gradual tweaks that you miss on the first (my case, 7th) attempt. Tilting the eyes, adjusting the mouth position and the curve of the upper lip, then adding color, and the white lashes & eyebrows to drive it all the way home. The whole idea behind this project was that the final piece could be used as a display model for a Yolandi Dressup game. And if you want to get a feel for the confidence level I had going into this, I wasn’t going to spend the $12 on the yolandidressup.com URL until it was successfully rendered in Illustrator. The whole process took place over the course of a month (that doesn’t include any building of the dress up game, art for the clothes, etc.). I’m proud to say that I feel vindicated. 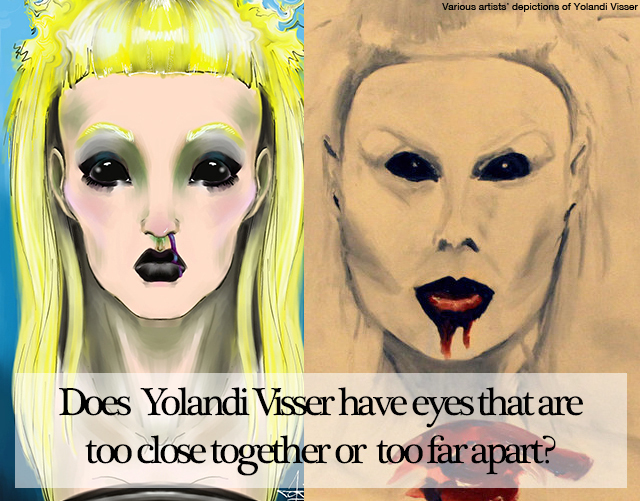 I drew a perfectly recognizable illustration of Yolandi with a variety of facial expressions to choose from, allowing me to be the creator of the greatest ever Yolandi Dressup game on Planet Earth (at least at this particular moment). 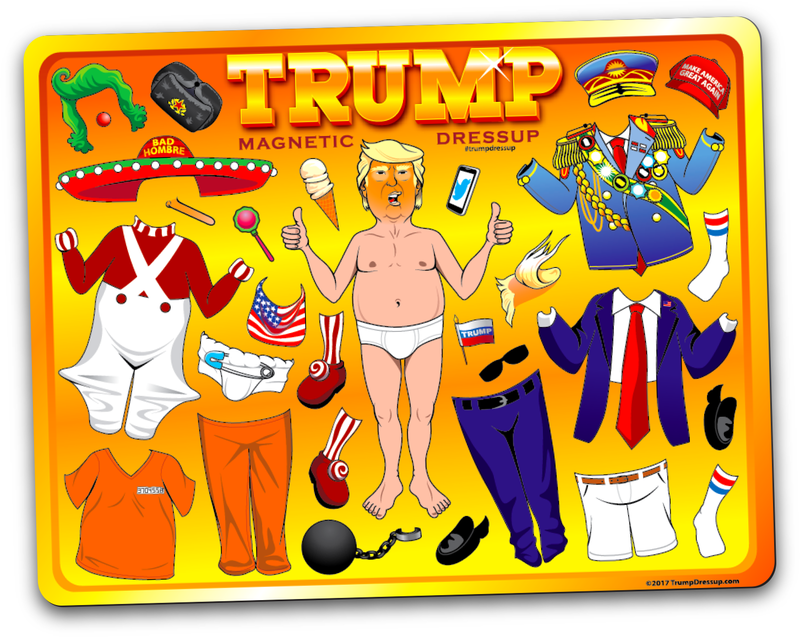 I urge you to check out the fruits of my labors at YolandiDressup.com, and try out my latest invention – a Clothes Toolbar on the far right side of the page. It’s my solution to getting all the clothes you’d want in a dressup game without all the art having to be tiny. The game is loads of fun, and I hope one day to hear she agrees.